I come from a family of serious pie-makers. Long before I was around, both of my grandparents on my father's side of the family were busy making pies for the restaurant they ran together. And though the restaurant has long since closed, the pie-making has gone on strong. Seeing my grandmother, as a kid, whatever the occasion, meant that a slice of pie, heavy with the season's fruit, was not far off. And my mother, having learned from my grandmother, has carried on that tradition. There is always one of her apple pies, still warm from the oven, waiting for me the night I get home from school for a visit. Digging into a slice of pie at the kitchen table while catching up with my mother--that's just a part of what coming home is for me. I wish I could say that some of my family's abundant pie-wisdom had made its way to me. But growing up, I just wasn't all that interested in learning--making pies looked difficult, anyway, and I didn't feel ready yet. So I left home for school without having tried my hand at making pie, and that was fine for the time being. But some occasions just call for pie, like when you and your friends have picked far more berries than you could possibly eat or when the stands at the farmers' market are groaning with fall apples. On occasions like these, I was certainly tempted, and eventually I did give in. But I was far from home at the time, and I didn't think that over-the-phone pie advice would work out particularly well, so I was more or less on my own. I can't quite remember that very first pie--whether it was strawberry-rhubarb or just rhubarb with orange zest--but I do know that it was a messy affair. I had trouble pulling together the pastry, and crimping together the top and bottom crusts had me stumped. But what was really disappointing was slicing into the baked pie, promising and golden, and seeing just how runny the filling still was. The bottom crust was a wet, pasty mess, and the fruit and its juices seeped out everywhere. I'm pretty sure that we ate our pie slices--if you could call them that--out of bowls that day. Since that first attempt, I've mostly left the pie-making to others. I've probably only made four or five more in the intervening years and not with much luck. Each one was, to one degree or another, soggy-bottomed. So I'm not quite sure why I was so determined to try again this past weekend with my parents visiting. I wasn't looking for family pie-wisdom--I shooed everyone out of the kitchen when I set to work. It probably had something to do with the sour cherries that started appearing at the farmers' market a couple of weekends ago. 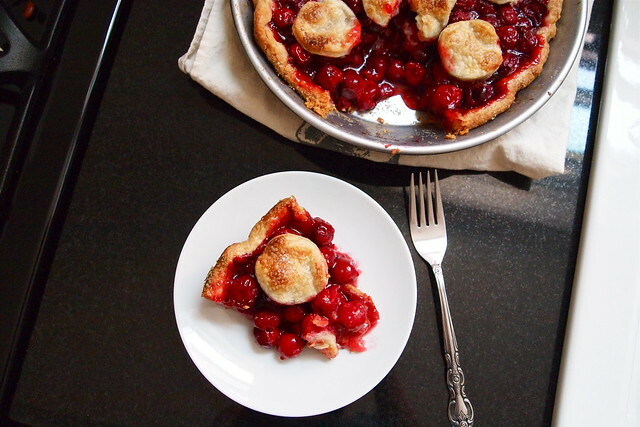 In her column, Melissa Clark once called sour cherries "the queen of all pie fruit," and though I'd never had sour cherry pie, the thought stuck with me. So, despite the heat and my terrible luck with making pies, I set about the business of pitting cherries and rolling out pastry dough. I have Melissa Clark and her pie-wisdom to thank for that. 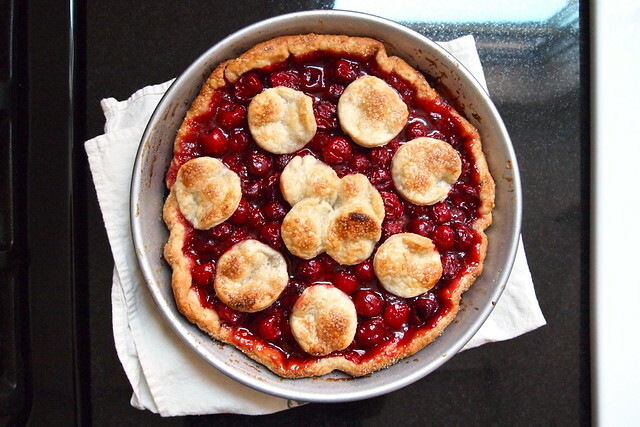 Her sour cherry pie is twice-baked. Taking a page from open-faced pie tradition--think pumpkin, lemon meringue, or chocolate cream--she has you par-bake the bottom crust before adding the fruit and covering it. Though it does mean that you have to bear with the oven being on for a little longer, it is well worth it. 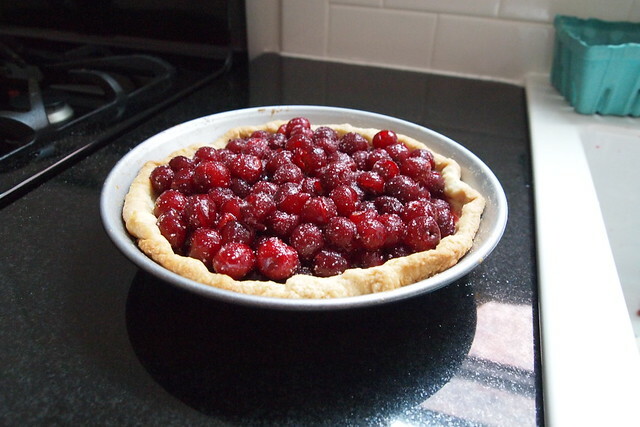 And the sour cherry, that queen of all pie fruit--I'll second that, Ms. Clark--she deserves it. Note: About the tapioca. I had a bit of trouble grinding my instant tapioca into a fine powder, and as a result, some stubborn tapioca clinging to the cherries at the very top of the pie never quite dissolved during baking. I fixed this by nudging those cherries over into the filling right after pulling the pie out of the oven. By the time it was cool enough to cut into, the tapioca had dissolved into the hot filling. About the top crust. I don't think I cut out quite as many circles as I should have for the top crust--I didn't have the patience to chill the scraps and re-roll the dough. But when it came to eating, I wish I had. Sugar-flecked, flaky top crust is good stuff. I advise adding more than pictured above. 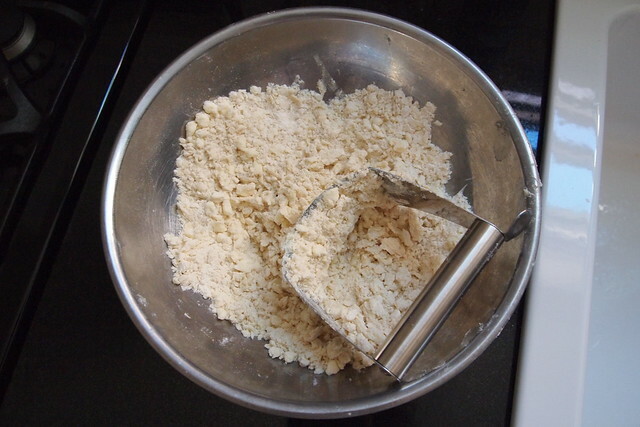 To make dough: in bowl of a food processor pulse together flour and salt just to combine. Add butter and pulse until chickpea-size pieces form. Add 3 to 6 tablespoons ice water, 1 tablespoon at a time, and pulse until mixture just comes together. Alternatively, cut the butter into the flour and salt by hand with a pastry blender, leaving the butter pieces the size of small peas. Add 3 to 6 tablespoons of ice water, 1 tablespoon at a time, and stir with a wooden spoon until the mixture just comes together. Separate dough into 2 disks, one using 2/3 dough, the other using the remaining. Wrap disks in plastic and refrigerate at least 1 hour (and up to 3 days) before rolling out and baking. Heat oven to 425 degrees F. Place larger dough disk on a lightly floured surface and roll into a 12-inch circle, about 3/8-inch thick. Transfer to a 9-inch pie plate. Line dough with foil and weigh it down with pie weights. Bake until crust is light golden brown, about 30 minutes. While pie crust is baking, prepare filling. In bowl of a food processor, combine sugar, tapioca and cinnamon (use more tapioca if you prefer a thicker, more solid filling, and less if you like a looser, juicier filling). Run the motor until tapioca is finely ground. Place cherries in a bowl and add sugar and tapioca mixture. Drizzle in kirsch or brandy and toss gently to combine. When pie crust is ready, transfer it to a wire rack to cool slightly and reduce heat to 375 degrees. Remove foil and weights. 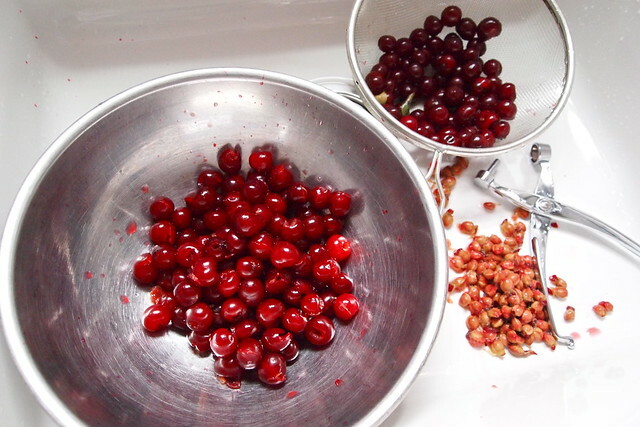 Scrape cherry filling into pie crust. 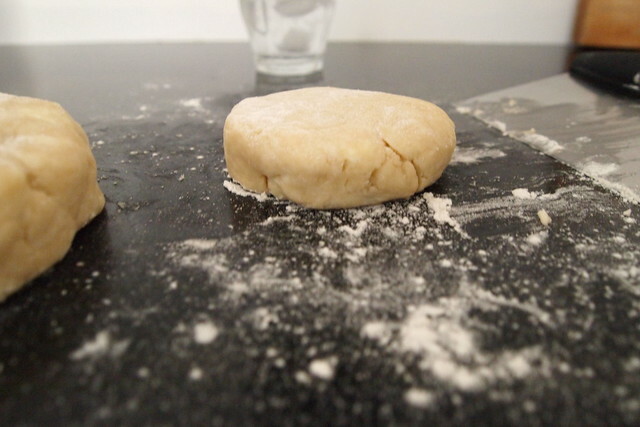 Place smaller disk of dough on a lightly floured surface and roll it 3/8-inch thick. Use a round cookie cutter (or several round cookie cutters of different sizes) to cut out circles of dough. Arrange circles on top of cherry filling in a pattern of your choice. Brush top crust with cream and sprinkle generously with Demerara sugar. Bake until crust is dark golden brown and filling begins to bubble, 50 minutes to 1 hour. Transfer pie to a wire rack to cool for at least 2 hours, allowing filling to set before serving. Ah I loved reading this, Katie. I'm jealous that you have pie-making in your family history, I'm always convinced that that type of thing gets passed down in your genes whether you like it or not. I guess for you it just came a few years late. :) The pie looks beautiful, by the way. Pure perfection. 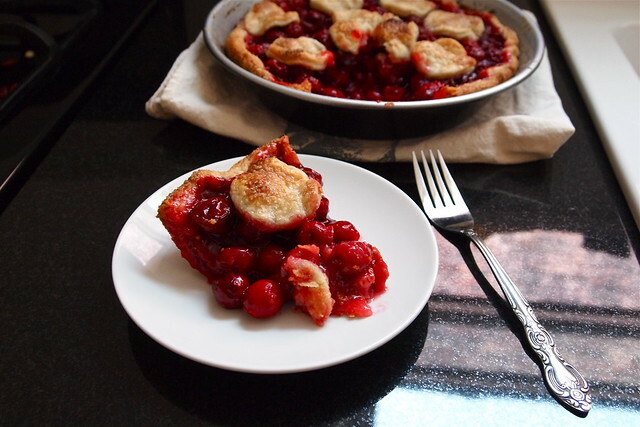 I'm really itching to make a cherry pie sometime this season, and I would love to try this one out. The sugared top-crust topping sounds so, so good. I've been in a pie place of mind recently. Pies are by no means my speciality though. I find the crust to be a bit of a battle - mostly because it just doesn't get quite as flaky as I want. Your crust looks über flaky, so flaky that those circular top pieces almost look like they have two layers. Perhaps it's in the genes? I like that this recipe calls for you to add 3-6 TB of water, one at a time. I think I"m going to try that next time. I generally just add it all in at once, and have found recently that it's too much. I wish my grandmothers / mom were bakers. There are no pie genes running through me. I will have to over compensate if I want my children to be bakers :) Love this post! I'm looking forward to hunting down some sour cherries, because I agree, they are the queen of pie. We are not really a pie family, either. I wish we were. I'd love to come home to a slice of pie. Your pie looks great, too. Baking the crust twice sounds like a great idea. I have to keep this in mind for the next time I make a pie. This looks delish. I love sour cherries. And, I would love someone to make me a pie, right now.